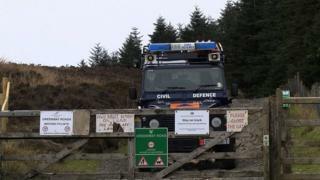 Two unexploded World War Two bombs have been discovered in the west of the Isle of Man, according to police. A spokesman said two mortars were discovered on a green lane track in the Sartfell area, near Kirk Michael. Military bomb disposal specialists are travelling to the island to help local emergency services detonate them. Sgt Andrew Reed said: "The area is currently cordoned off and will remain so until the [bombs] are disposed of - the risk to the public is low."